Photos of the UK Walks can be found HERE. 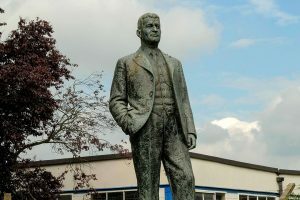 All of Kevin Rushby’s blog posts about UK walk. 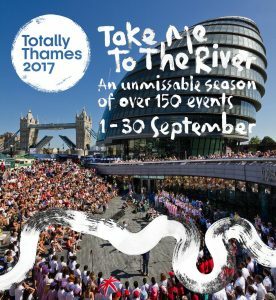 The Silk River walking programme featured as part of the Totally Thames festival, and was also an official event included in the UK India 2017 season curated by the British Council. Our team of artists led by Kinetika’s founder, Ali Pretty, worked with communities along the route to devise a series of unique walking events that will reveal the stories of those who live and work on the river and the connections they have with parallel communities living alongside the Hooghly in West Bengal. Each community created a 6 metre hand-painted silk scroll that is a visual narrative of their walk. 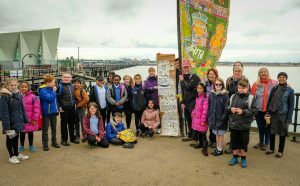 Every day a core group will welcomed 2 new scrolls to be carried by participants from Kew Gardens to Southend where there was a spectacular finale moment as we walked all 20 scrolls to the end of the mile-long pier. The journey was full of surprises, you could join for a morning, an afternoon, one or ten days and every day more stories were revealed online, so you could experience and interact with us wherever you were. 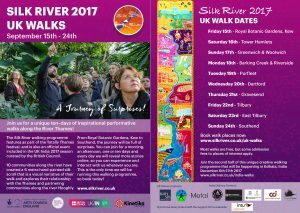 The UK walk pages will remain on the Silk River website as an archive of the routes, the people involved and a photo gallery. 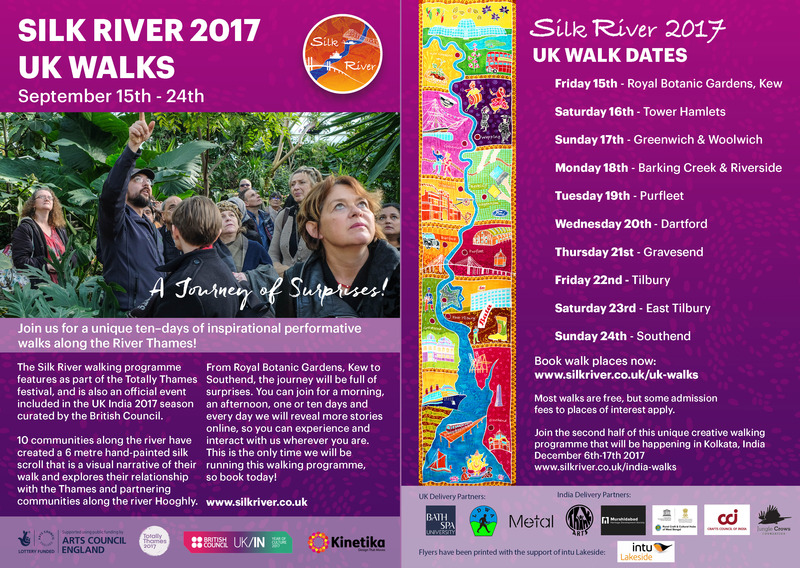 Supported by Arts Council England, British Council, Dartford Council, Kent County Council, Thurrock Council, Southend Council, Royal Borough of Greenwich, Barking & Dagenham CPP, Metal, Royal Opera House Trailblazers, Long Distance Walkers Association (London Group) and Kew Gardens. 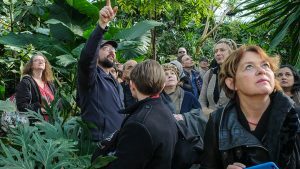 We launched our 10-day performative walk at Kew Gardens’ celebrating their historic and contemporary links with India. We uncovered treasures from Kew’s Economic Botany Collection and the trade links between continents, as well as walking among the living collection of Indian specimens in the Palm House, and enjoyed the paintings of Indian plants by Victorian painter and explorer Marianne North. Read more HERE. This walk is now complete. Sat 16th Sept – East London’s Silk Trail – Tower Hamlets. We followed the silk trail in Tower Hamlets and joined the Council’s ‘A’ Team Arts for a day of performances at six historic locations. We traced the footsteps of migrant Huguenot silk weavers through the grand houses in Fournier St, past the rag traders in Brick Lane and on to the park dedicated to the memory of Altab Ali – a symbol of the anti-racism movement. At the site of the “Strangers’ Home” we learned about the lives of the East India Company lascars and their protests, and visited the church of the East India Company. We understood their stories through textiles, and performances from today’s younger generation of those aspirational communities. Through the eyes of a Lascar sailor, the ship’s cook, we explored life on board Cutty Sark, one of the finest trading vessels that sailed between the Thames and the Hooghly River. After the morning walk, we continued to Woolwich Arsenal to hear personal stories from the local community and listen to sea shanties before being drummed to the riverside to take the 6 scrolls over the river on the Woolwich Ferry. 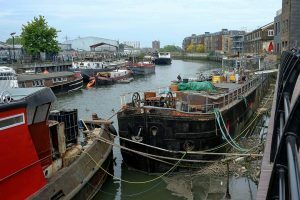 Barking Creek was once a busy industrial port while today Barking Riverside is on track to be the biggest new housing development in London in effect creating a new town. Stories of the river and the connections between old and new met during this walk, from the lives of fishing families revealed at St.Margaret’s Church, to our modern day river community which is bringing new life to the water, and Barking Riverside who are creating 10,800 new homes. 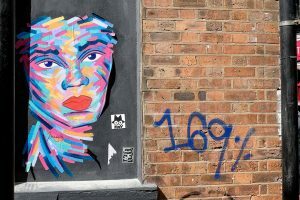 Local residents and Cultural Connectors developed this walk drawing on stories from the borough’s past and demonstrating their vision and partnership working to create positive change for its future. Read more HERE This walk is now complete. We paraded the 8 giant silk banners through Rainham Marshes to enter Purfleet at the RSPB centre, followed by a historical walk that included haunts from Dracula’s Thameside residence and led us through new housing to High House Production Park. Here we met members from the Royal Opera House, students of the National College for the Creative Industries and artists who’ve found a new buzz outside of East London. Landing just west of the Dartford Bridge on the gravelly foreshore with 10 giant silk flags (the Silk River Scrolls), we met local rangers to take us down the old tramway past the site of the old smallpox hospitals before arriving at Ruby Tuesday Avenue. 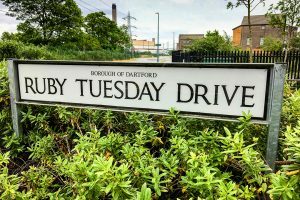 We visited the home of Mick Jagger, the birthplace of The Rolling Stones and artist Sir Peter Blake, discovering Dartford and the legacy from its pop culture past that still thrives in the town today. The world’s shipping still passes the town’s front door. The long-established industrial foreshore was once the site of the earliest known cement kiln and continues to be the site of paper mills that once drew the Sikh community to settle here. 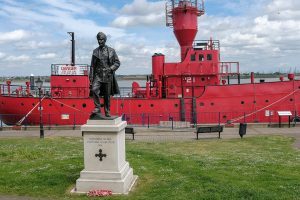 A six-mile walk along the foreshore and into the picturesque town centre through the old, newly restored covered market and a visit to the truly spectacular Sikh temple, before boarding LV21, the lightship moored at the riverfront for an early evening spoken word performance. 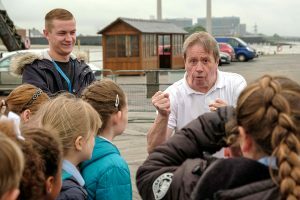 Sat 23rd Sept – In other people’s shoes, East Tilbury. Tomas Bata had a vision, to make shoes that everyone could buy. Having successfully begun his business in his home town of Zlin, Czechoslovakia, he set his sights on East Tilbury. Transforming the potato fields into the modernist Bata Estate in the 1930’s, this small community had its own cinema, swimming pool and surely Thurrock’s first Expresso bar. Meet families who grew up here with connections all over the world, and witness the story of Johnny, the shoemaker with smelly feet. What’s happened to Bata now? 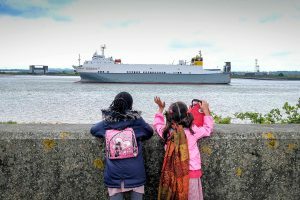 New developments are coming to East Tilbury just as they are to Batanagar in Kolkata. 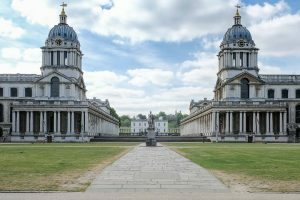 How do London and Kolkata compare in their approach to riverside developments? Sun 24th Sept – It’s a long way to Southend! Ready for a hearty portion of Leigh-On–Sea’s fish and chips, we begin our last day carrying all 20 scrolls through this thousand-year-old community of fishermen. We meet local artists and hike up the hill to Chalkwell Park to experience Metal’s digital exhibition on ipads. Fuelled by legendary Rossi Ice cream, we gather in numbers to parade up the pier for a finale performance from the Mudlarks Choir, and a parting moment when we send our stories out into the ocean with a blessing from the Hindu Association for the scrolls safe passage from London to Kolkata.